Comics In 5 Panels: Teen-Hero Month: Young Avengers. One of the major differences between DC and Marvel is the sidekicks. Sure, Batman and Green Arrow are the only DC heroes who have had a apprentice the last 20 years, but DC has a longer history with kids in tights who helps adults with fighting crime. One of the theories is that it's because of Bucky. THE kid sidekick of the Marvel U. When he died, so did the sidekicks. If teenagers became superheroes, they did it alone, since no adult heroes would repeat Captain America's mistake and lead a kid into battle. This theory came from the pages of today's comic; Young Avengers. Young Avengers issue 1 takes place some time after the Avengers Dissembled event, where the earth's mightiest heroes had been torn apart by Scarlet Witch and plot-holes at the size of my ego. 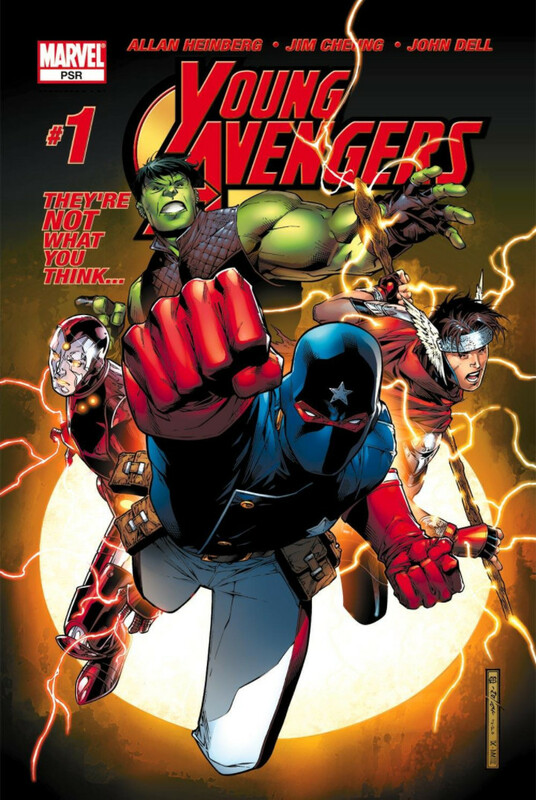 But finally, a team of what could look like Avengers has appeared. The thing is... they kinda look like fan-boys. We have a Teen-Thor with no hammer, but actual lightning control. A polite young Hulk. A boy with armor that seems to be more advanced than Iron Man. And finally, and maybe most unsettling; a young man in a modified Bucky outfit. This may be the second best sort-off Avengers spin-off series. What is really great about it is the characters. Not so much their personality and character design, but the art of discovering who they are, and what connection they actually have to the Avengers. And believe me, the one with the most shocking background is Iron Lad. A character I feel has been ruined in the story-line "Avengers: Children's Crusade" that I can not recommend at all. The series only ran for 12 issues and a special, but it has plenty of action, nice art-work and build-up of the young heroes who are today considered the Teen Titans of the Marvel U(the New Warriors are still better, though...). But I must admit... I'm not crazy about Kate Bishop. It's not that I hate her. But I don't like her either. I don't really know why, I guess it's like that there are some types of food you don't want to eat. It's not that it makes you bark, you just don't... like it. And the fact that her origin involves her being raped is a bit of a turn-off. But hey, that's just me. And that was the end of Teen-Hero Month. Join me this Friday, as we turn the insanity up to eleven. It's time for Manga-Mania May! Strangely enough, while DC's been reducing the number of sidekicks and "legacy" heroes left and right with the New 52 (where's Donna Troy? Jade? Obsidian? Connor Hawke? etc..), Marvel's been adding new legacy characters everywhere and it seems that there's now more sidekicks at Marvel rather than at DC.. I always liked these Young Avengers. Kate Bishop is awesome! Well, at least once you reach Matt Fraction's Hawkeye series! The Avengers used to have a tradition of letting young heroes into the team and letting them prove their worth. Looks like it's going to be revived. I'm looking forward to it, actually. It looks like a more traditional team-book. And I had about enough of the Hickman run and it's "it's all the nerds fault!" story-line. Mark Waid is going to write it, right?